One of the best reading experiences is when a book slowly and unexpectedly takes hold of your heart and whole being. Then when you finish the last page, you’re left in pieces. 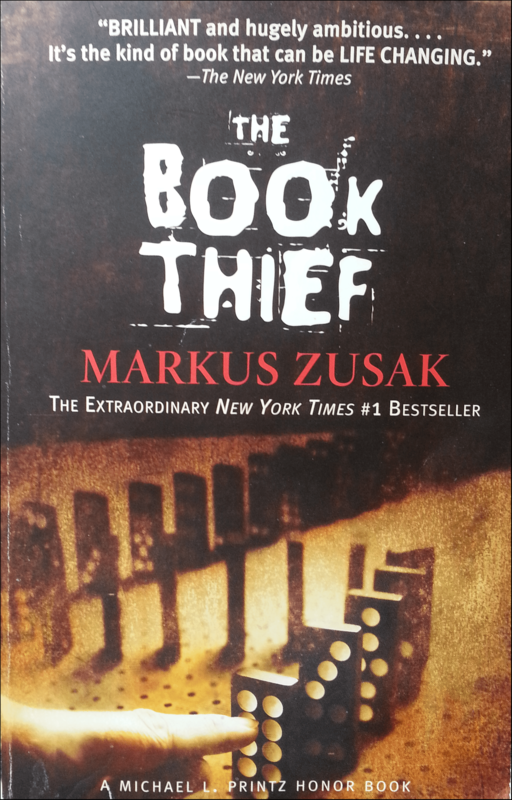 The Book Thief is one of those books. This novel is told through the perspective of Death during a World War II German. Death becomes intrigued with a girl named Liesel Meminger. In the beginning of the story, Liesel’s mother is taking her and her little brother to live with a foster family. During the trip, Liesel’s brother dies. When he was being buried, one of the cemetery workers dropped his work manual. Despite Liesel not being able to read, she sees the book and takes it. This one action marks the transformation of Liesel Meminger. You follow her journey of learning to read, to steal, to grow up fast, and how to connect with people and herself through written words. There is a lot of hype surrounding this book. A LOT. I had no plans to read it, but I saw it at my local bookstore for only $5, so I bought it. I didn’t read it for a long while. In January of this year, I felt it was time to give it ago. I started it and thought it was a beautifully written book, but I wasn’t seeing the GREATNESS that I’ve heard so much about. I felt like this for maybe about the first third or so of the book. However, things started to change once the character of Max, a young Jewish man that is hiding in her basement, is introduced. The relationship between him and Liesel is one that sticks with you. As their relationship grows, your feelings for the book grow. They have a very intimate relationship, and sometimes, as the reader, you feel like you’re intruding. The relationship between Liesel and her father was also a special thing to witness, but not to the extent of her and Max’s. Liesel’s father taught her so much about life, but Max really opened Liesel’s eyes, heart, and world. Writing this about Max and Liesel brings all the emotions back even 8 months later. Speaking of characters, I love how each character was its own. No two people were the same; they all had their own distinct personalities and flaws. I love how Liesel’s foster parents were portrayed: the mother is a bit of a tyrant (with a soft inside) and her father is the understanding voice of reason. Her best friend Rudy is the ambitious girl crazy neighbor boy. The world building was great. I felt like I was a member of the neighborhood. I could picture myself wherever the story was at: the school, courtyard, basement, house. The beautiful writing definitely helped with that. Every sentence felt like it was a painting. Along with that, there are certain scene that I can still clearly see in my head because of the writing, and these scene are not particularly heartwarming either. That’s just one of the many reasons this is a great book. It sticks with you. When you finish this book you feel like your heart was ripped open, kicked on, stabbed, chewed apart, and spit back out. You know what? I wouldn’t have it any other way.